This is just a short note that CryptoMiniSat 3.3 has been released. This is mainly a bugfix release. I have managed to make a fuzzer that simulates library usage of the system by interspersing the CNF with “c Solver::solve()” calls and then checking the intermediate solutions. Checking is either performed by verifying that all clauses are satisfied, or if the solution is UNSAT, by using a standard SAT solver (I use lingeling). This turned up a surprising number of bugs. I have also fixed the web-based statistics printing which should now work without a hitch. The non-bugfix part of the release is that CryptoMiniSat now saves memory by dynamically shortening and reallocating the watchlist pointer array and some other data structures. This can save quite a bit of memory on large, sparse instances. The changes made were threefold. First, memory usage has been greatly reduced. This is crucial, because memory usage was over 7GB on certain instances. Secondly, the implication cache wasn’t very well-used and an idea that came to my mind greatly improved performance on most problems. Finally, time limiting of some inprocessing techniques on certain types of problems has been improved. On instances that produced a lot of long learnt clauses the memory usage was very high. These learnt clauses were all automatically linked in to the occurrence list and consequently took large amounts of memory, sometimes up to 10GB. On other instances, the original clauses were too numerous and too large, so putting even them into the occurrence list was too much. On these instances, variable elimination is not carried out (or carried out only later, when enough original clauses have been removed/shortened). 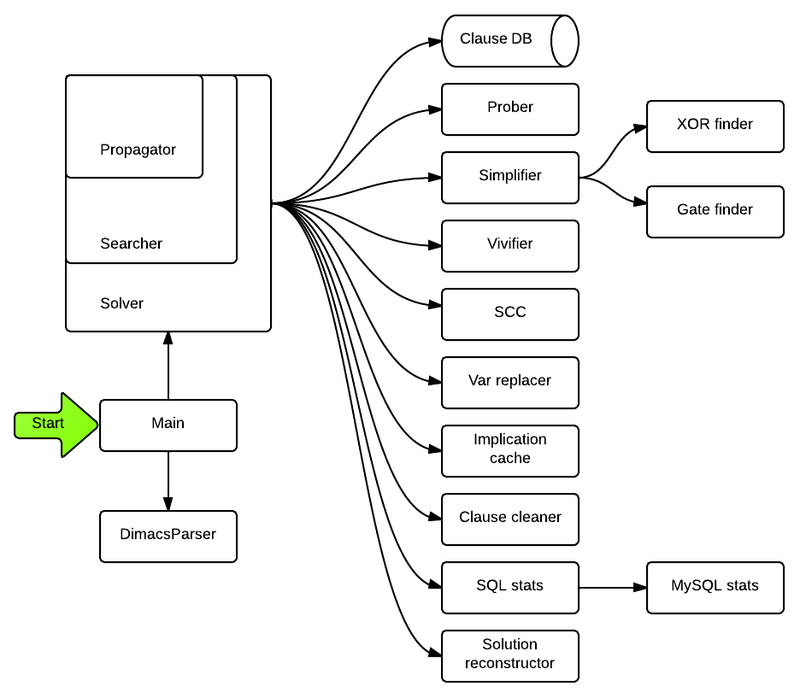 To debug some of these problems, I wrote a fuzzer that generates extremely large problems with many binary and many long clauses, it’s available here as “largefuzzer”. It’s actually quite nice with many-many binary clauses so it also can fuzz the problems encountered with probing of extremely weird and large instances. CryptoMiniSat uses implied literals, i.e. caches what literals were propagated by each literal during probing. It then re-uses this information to subsume and/or strengthen clauses. This is kind of similar to stamping though uses more memory. It is actually useful to have alongside stamping, and I now do both — propagating DFS that stamping requires is expensive though updating cache during DFS is just as easy as during quasi-BFS. The trick I discovered while playing around with cached implied literals is that if literal L1 propagates L2 and also !L2 then that means there are conceptually two binary clauses in the solver (!L1, L2), (!L1, !L2), so !L1 is TRUE. This is of course trivial, but I never checked for this. The question most would raise is: why would L1 propagate both L2 and !L2 and not fail? The answer is kind of tricky, but very interesting. Let’s say at one point, L1 propagates L2 due to a learnt clause, but that learnt clause is then removed. A new learnt clause is then later learnt, and with that learnt clause in place, L1 propagates !L2. Now, without caching, this would be ignored. Caching memorizes past conceptual binary clauses and re-uses this information. This is not an optimization that only looks good on paper, it is very good to have. 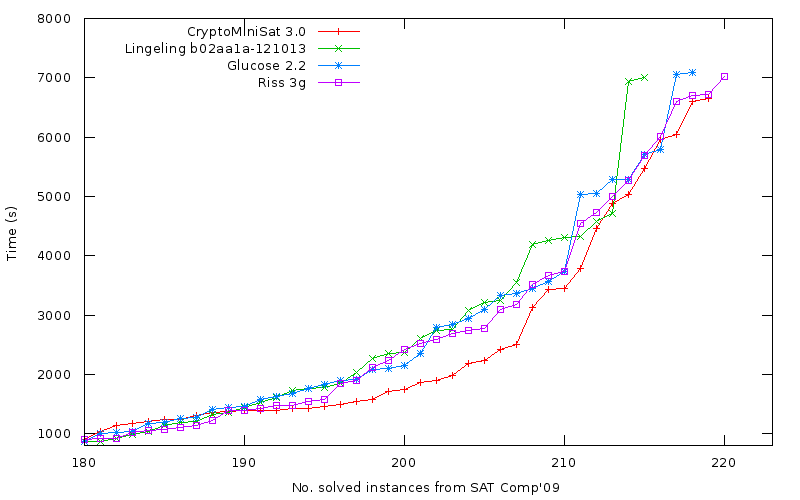 With this one optimization, I gained 5 instances from the SAT Comp’09 instances with a 1000s timeout (196 solved -> 201 solved). I can’t right now imagine how this could be done with stamping effectively, but that doesn’t mean it’s not possible. Though, according to my experience, stamping doesn’t preserve that much information over time as it’s being updated (renumbered) frequently while the cache is only improved over time, never shrunk. A possibility would be to have more than one stamp system and round-robin selecting them. However that would mean that sorting of clauses (for shrinking) would need to be done more than once, and sorting them is already relatively expensive. I sometimes feel that what stamping gains in memory it looses on sorting (i.e. processing time) and lower coverage (re-numbering). Martin Maurer has been kind enough to file a lot of bug reports about probing and variable elimination taking too much time, sometimes upwards of 150s when they should take around 20-30s maximum. While investigating, it tuned out that the problem was very weird indeed. While trying to eliminate or probe one variable the time for that one variable took upwards of 100s. This was completely unexpected as the code only checked for timeouts on a per-variable basis. In the end, the code had to be improved to track time on an intra-variable basis in both systems. While at it, I also added intra-variable time-tracking to implicit clause subsumption and strengthening too. So, over-times should less prevalent from now on. As an interesting side-note, time-limiting on probing is now so fine-grained that a 32-bit unsigned integer would overflow within 15s if used as the time-tracker. 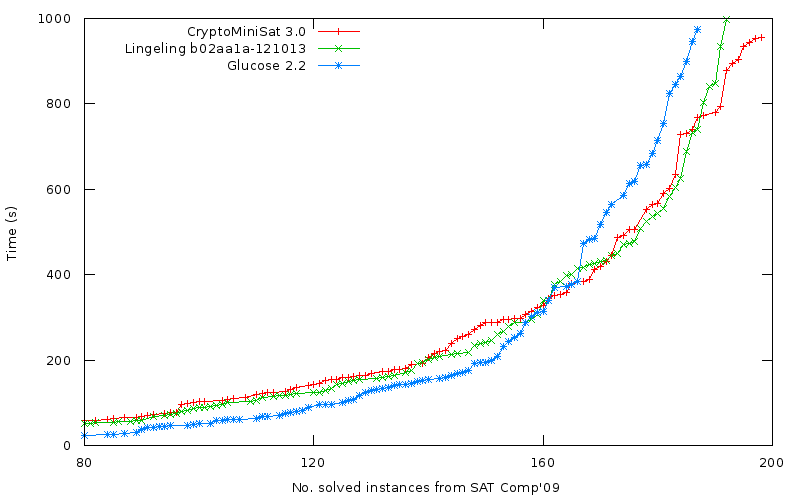 This of course does not mean that CryptoMiniSat is faster than the other solvers in general. In fact it is slower on a number of instances. What it means is that in general it’s OK and that’s good enough for the moment. It would be awesome to run the above experiment (or a similar one) with a longer timeout. Unfortunately, I don’t have a cluster to do that. However, if you have access to one, and would be willing to help with running the 3 solvers on a larger timeout, please do, I will post the updated graph here. Riss 3g is winning this race, with CryptoMiniSat being second, third is glucose, and very intriguingly lingeling the 4th. Note that CryptoMiniSat leads the pack most of the time. Also note, this is the first time CryptoMiniSat 3.0 has been run for such a long time, while all the other competing solvers’ authors (lingeling, glucose, riss) have clusters available for research purposes. For those wondering if they could use this as a base for SAT Competition 2013, the good news is that the licence is LGPL so you can do whatever you want with it, provided you publish the changes you made to the code. However, I would prefer that you compete with a name such as “cms-MYNAME” unless you change at least 10% of the code, i.e. ~2000 lines. For the competitions after 2013, though, it’s all up for grabs. As for companies, it’s LGPL, so you can link it with your code, it’s safe, you only have to publish what you change in the library, you don’t have to publish your own code that uses the library. In case you’ve missed it, the CCC Camp was a great opportunity to meet people both working in security and otherwise. I have even met a very kind Taiwanese researcher who worked on SAT and Gröbner basis: in fact, if you haven’t had the chance to read this paper, I highly recommend it. A set of kind Taiwanese researchers recommended this paper to me, and I think it’s the most interesting SAT paper I have read in the past year.